Start with cold fresh water. A great cup of coffee starts with good clean water. We recommend 2 tablespoons of coffee per cup or 1.2 to 1.5 oz. per pot. Adjust to your own taste. If you grind your own beans use the correct grind for your brewer. Too fine a grind will produce a bitter coffee, too course will produce a weak coffee. Place coffee in an airtight container. Expel as much air as possible. DO NOT PLACE IN FRIDGE. 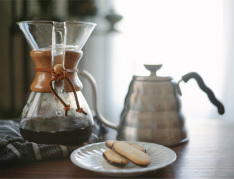 Coffee is one of the best products for absorbing odors. Coffee may be frozen but only remove as much as will be used each time.